Our fascination with sharks inspires both awe and dread, and we can’t seem to get enough of them. With the annual “Shark Week” nearly upon us, courtesy of the Discovery Channel, it’s time to take the hype and turn it to a better understanding of our own local ecosystem -- which will hopefully help to keep this fragile web of life intact. Scientists warn that worldwide, sharks are being over-harvested with estimates of more than 100 million sharks taken annually for their skins, liver and fins. We don’t have the data about some shark species populations to begin to understand how much “take” can be supported. With the most well-known predator just offshore and common around the Farallon Islands, Great White sharks overshadow more common sharks in our area. Our bay supports eleven shark species including Broadnose Sevengill sharks, the apex predator in the bay. 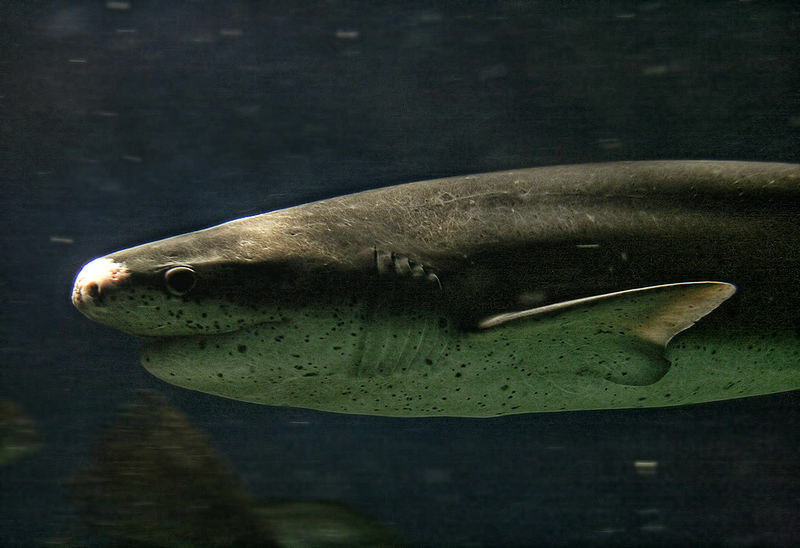 I had the opportunity to chat with Keith Herbert, Assistant Curator of Animal Care at the Aquarium of the Bay, about a joint study they did with UC Davis on the Bay’s Sevengill Sharks. Sevengill sharks resident to San Francisco Bay: The study indicates that Sevengill sharks demonstrate a high degree of residency in San Francisco Bay. Daily and seasonal movement patterns in the bay: Detections at the Golden Gate occurred day and night (indicating site fidelity), with more than 50% of tagged sharks detected in the bay throughout most of the year. Sevengill “hotspots” within the bay: Golden Gate Bridge and Alcatraz areas are significantly preferred areas. SNE: What did the study reveal that most surprised you about Sevengill sharks? KH: While not surprising, it was good to have solid confirmation that the bay is an important habitat for this species. It was remarkable to see the visible patterns charted out of how frequently the same individual animals visited the same areas in a specific range. SNE: What questions remain unanswered that future studies will focus on? KH: There is still plenty to study to be done on environmental preferences (temperature, salinity, tides, etc), behavioral patterns and reproductive research. SNE: What do you find most interesting about bay sharks? KH: While Sevengills are a common species in the bay, there is much to learn about their ecology; we’re very fortunate to be able to study the wild populations of the Bay while simultaneously researching the sharks here at the Aquarium more closely. Being an apex predator, these animals are a good indicator of the overall health of the estuary and they serve as ambassadors to the guests who can learn more about them here in person. San Francisco and Humboldt Bays are the two primary nursery grounds along the California coast where Sevengills are known to pup, so conservation of these habitats is vital. Climate change may also pose a threat to their need for their pups' sheltered marshland habitat. 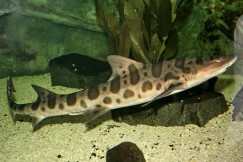 You can get more information about Sevengill sharks by viewing the Aquarium of the Bay's exhibit or watching this video posted on their website. Sustainable Seafood choices with Bay Area restaurants listings.